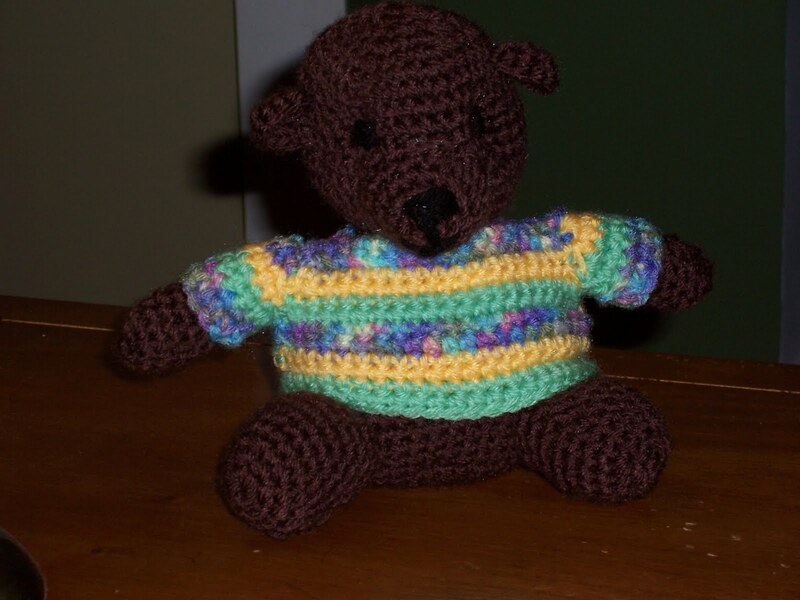 My very first amigurumi bear :) Isn't he precious? I had a hard time getting a good shot of him. It was like the paparazzi in my living room last night, I snapped so many of him. I just adore him. He is bound for the baby of one of my knitting group friends. In other craft news, I FINALLY started to bind off my freaking shrug. I'm nearly done, and then I'll have to seam it up, and weave in all the ends. I'm certain that these final details will prove as endlessly boring and frustrating as the rest of this project has been, but no matter. I'm just SO relieved that I'm nearly done. The New England Knits sweater is going beautifully. I'll post its picture on Monday :) That one has been a nice challenge for me. It has involved a few techniques I've never used before, *but* for knitting and crochet (anybody who wants to learn!) YouTube is *awesome*. When I come to something that I don't know how to do, I just pause until I can get on the computer, and YouTube it. Within 2-3 demonstrations, I can do it myself. Love it. Hi is such a cute little guy! Great job! It's so bad of me to covet something that is going for someone else, but oh well, he's just too adorable. That sort of thing is such a lost art. I don't know of any relatives who knit anymore. And I'm positively horrible at it. I don't do well with knots. Oh well. I'll sit on my happy computer and look longingly at the cute bear and think one day I will conquer those knitting needles.